Considering paddling with us here in Jervis Bay? Not only is our scenery epic, we’ve got an abundance of wildlife that you just might spot in the wild. Check out all the amazing local marine and bird life you might see during your journey with Jervis Bay Kayak Hire. (PS: If you want to get a chance to spend more time wildlife spotting, check out our eco cruises). If you’re lucky, you might catch a glimpse of humpback whales during the whale season here in the region. Every year, these massive, majestic marine mammals make an extraordinary journey. Swimming thousands of miles from the chilly Arctic waters, the humpbacks come to our milder seas to give birth to their young. From approximately May through November, whales are regularly spotted throughout Jervis Bay. It’s not uncommon to see the young calves moving alongside their mothers. These babies remain at their Mum’s side for an entire year, nursing on nutrient-rich milk for much of that time. Bottlenose dolphins are an extremely common sighting in the area. In Jervis Bay, we have a resident pod of these agile cetaceans. Roughly 60-70 dolphins reside in the region year round, and it’s an absolute treat to see them swim up alongside you as you are kayaking or SUP paddleboarding. Dolphins are known for their high level of intelligence, as well as their ability to communicate via clicks, squeaks, and other “chattery” vocalisations. The Australian Fur Seal is a large breed of seal that lives and breeds in nearby colonies. While it may be less likely that you encounter these during your paddle trip, if your itinerary takes you past their colony on Drum & Drumsticks, you may get to watch them in action. 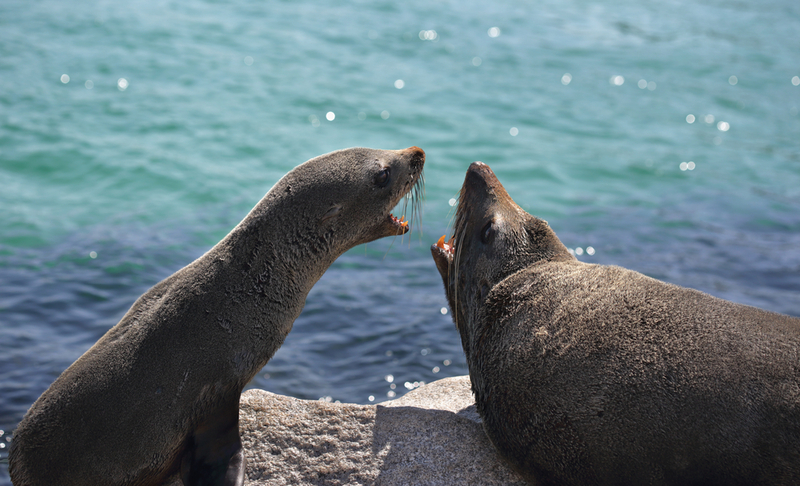 Awkward and clumsy on land, fur seals move through the water with amazing grace and speed. When in the water, they often disappear into the deep, as they are able to dive as much as 200m as they hunt for octopus, squid, and their other culinary favorites. In addition to the special species above, as you explore Jervis Bay on your kayak you will have the opportunity to see much more. Local wildlife includes manta rays, turtles, plenty of fish, sea birds, and even fairy penguins. We hope you’ll join us out on the bay to discover our gorgeous area—and hopefully “meet” its coolest residents.